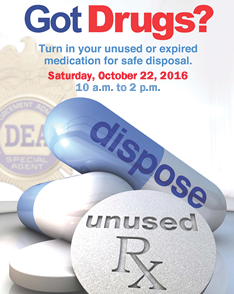 The Randolph Township Police Department, in conjunction with the Morris County Prosecutor’s Office and the Drug Enforcement Administration (DEA), will be hosting Operation Take Back Day on Saturday, October 22, 2016 from 10:00 a.m. to 2:00 p.m. Residents can properly dispose of their unwanted, unused or expired medications in the front of the Acme supermarket located at 690 Millbrook Avenue in Randolph. This program is anonymous, therefore, all efforts will be made to protect the anonymity of individuals disposing of medications. For more information, visit the DEA website.